This article is about the location in the Game & Watch Gallery series. For other museums in the Mario franchise, see Category:Museums. For the mode in Mario Party 9, see Mario Party 9 § Museum. 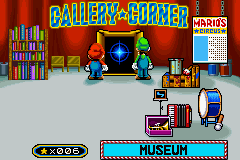 The Museum (Gallery Corner in Game & Watch Gallery) is a location in the Game & Watch Gallery series that exhibits numerous Game & Watch titles. Most of the Museum's games are playable through the Game & Watch Gallery series, and some of them are for display only. The Game & Watch Museum in the first Game & Watch Gallery game is called "Gallery Corner" and has a total of 16 games. It is hosted by Mario. The games are unlocked by obtaining 400 and 800 points in the Modern and Classic versions of Manhole, Fire, Octopus, and Oil Panic (any difficulty). Inside the games, the release date, the series it was released (in certain games, some trivia information), and a description are given. It has the same music as the Game Select, and every column has its own song (the third and fourth columns have the music from Tips & Attacks and Notes, respectively). In Game & Watch Gallery 2, the Museum has a total of 24 games (including the ones from Game & Watch Gallery). It is still hosted by Mario. It now shows the handheld device from its original release. The games are unlocked by collecting 10, 20, 30, 40, 50, 60, 70, and 80 stars. Outside the games, the release date and the series it was released are shown, and inside the games, the description appears. To unlock the complete Museum, 120 stars and linking to Game & Watch Gallery (must have 1,000 points in all eight games) are required. It now has its own song (also applies to all of the Museum's games). In Game & Watch Gallery 3, the Museum has a total of 32 games (including the ones from Game & Watch Gallery and Game & Watch Gallery 2). For the last time, it is hosted by Mario. The handheld devices and the information structure are reused from Game & Watch Gallery 2. The games are unlocked by collecting 5, 15, 25, 35, 45, 55, 65, 75, and 80 stars. To unlock the complete Museum, 120 stars or linking to Game & Watch Gallery (must have 1,000 points in all eight games) and Game & Watch Gallery 2 (must have 120 stars from this game) is required. It still has its own song (also used in the unlockable games), and linkable games now have a new song. In Game & Watch Gallery 4, the displays of the games are instantly shown upon entering the Museum. It has a total of nine games. The displays are unlocked by collecting 10, 15, 25, 30, 40, 45, 50, and 60 stars, then the playable versions of the games are unlocked by collecting 80, 90, 100, 110, 120, 130, 140, 150, and 160 stars. The handhelds are no longer shown in here. Vermin's appearance in Game & Watch Gallery is very similar to the one from Game Boy Gallery. Manhole's appearance is the one from the Gold series. This page was last edited on March 23, 2019, at 16:47.